La pli maljuna John Lawrence Seigenthaler (IPA:'sigɛnˌθɔlɚ), n. 27-an de julio 1927 en Nashville) estas usona ĵurnalisto kaj verkisto. Seigentheler vizitis la Peabody College-on en Nashville. Li eklaboris en 1949 ĉe la gazeto "The Tennessean". Ekde 1962 li estis tie redaktoro kaj en 1973 eldonisto. De 1982 ĝis sia retiriĝo, estis li prezidanto. Seigenthaler laboris ankaŭ kiel prezidanto de "American Society of Newspaper Editors" kaj de 1982 ĝis 1991 ĉe USA Today. Seigenthaler edzinigis en 1955 Dolores Watson. Ilia komuna filo estas John Seigenthaler Juna, kiu naskiĝis en 1955 kaj laboras ĉe NBC pri eventoj. La pli juna filo Thomas Seigenthaler estas fondinto de "Seigenthaler-fondaĵo". En majo de 2005, iu anonimulo verkis en al angla Vikipedio artikolon pri li, en kiu la anonimulo suspektigis lin pri kontakto al murdo de Robert kaj John Kennedy. Tiu versio estis nur en septembro de 2005 malkovrita far amiko de Seigenthaler. Post lia kontakto al Vikipedio, la artikolo estis forigita. Seigenthaler nomis Vikipedio la 29-an de novembro 2005 pro tiuj kulpigoj sentaŭga por esplorfonto (‘’"...Wikipedia is a flawed and irresponsible research tool...[f]or four months, Wikipedia depicted me as a suspected assassin."’’) . Tio ekis diversajn komentariojn pri la temo kaj fidindeco de Vikipedio. La anonimulo malvualiĝis kiel Brian Chase dungito (kaj en kelkaj tagoj maldungito de Rush Delivery. La aferon spuris Daniel BRANDT. 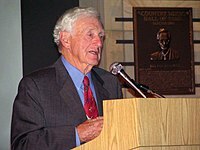 Seigenthaler, John (2004). James K. Polk: 1845-1849 (American Presidents Series). New York: Times. ISBN 0805069429. Seigenthaler, John (1997). Nashville: City of Note (Urban Tapestry Series). Memphis: Towery. ISBN 1881096432. Seigenthaler, John (1974). The Year of the Scandal Called Watergate. New York: Times. ISBN 0914636014. Seigenthaler, John (1971). A Search for Justice. Aurora. ISBN 0876950039. Seigenthaler, John (als Ko-Autor): An Honorable Profession: A Tribute to Robert F. Kennedy. Ĉi tiu paĝo estis lastafoje redaktita je 16:55, 10 feb. 2019.